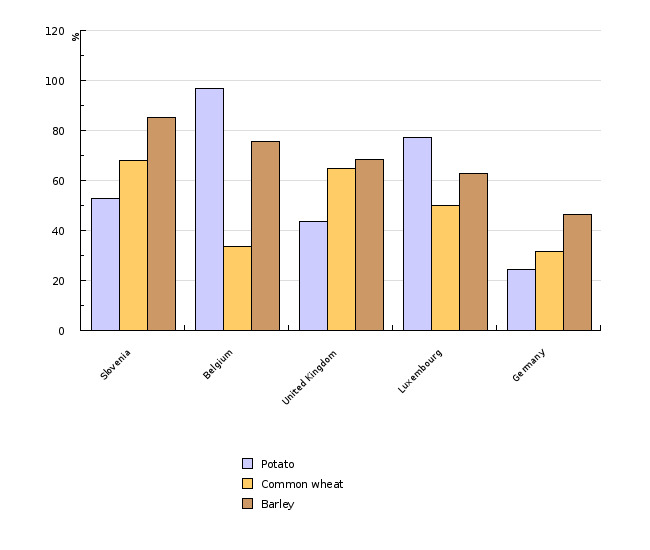 The share of the five most important sorts for individual species of crops prevails in the majority of the crops, except in maize, wheat and potato. Since 1997, the total number of sorts in production in the stated three groups of crops has increased and a tendency toward greater diversity has been observed. In other crops, however, the number has remained unchanged or has decreased. Data collection on diversity for individual species of crops and trend monitoring must be improved and coordinated with other EU members. Genetic diversity of sorts and species of crops is part of the global biodiversity. An increase in the intensity of farming results in a decrease in the production of traditional old sorts and species, and thus a decrease in genetic and species diversity. The reason for this is the use of a smaller number of modern sorts intended for intensive agricultural production, which mostly originate in one source and thus limit genetic diversity. The indicator presents the number and share of sorts for an individual species or group of crops. It shows the genetic diversity of individual species of crops, the pressure of the prevailing genotypes and sorts, and genetic diversity in the system of agricultural production in Slovenia from 1997 to 2004. The indicator only defines diversity in plant production, and not the state of the entire agricultural ecosystem. In the EuroSemStats file, maintained by the NIAB (National Institute of Agricultural Botany, Cambridge, Great Britain), the estimates are based on the data from the EU countries on the area under seed production. In Slovenia, these estimates are based on data for total plant production, with the exception of potato, where we can only deduce the sort structure in the production of potato for human consumption from the data on seed potato sales. Phytosanitary Administration of the Republic of Slovenia, 2008. Phytosanitary Administration of the Republic of Slovenia, 2005; EuroSemStats, 2002. The goal is to comply with the international obligations and treaties: Convention on Biological Diversity, International Treaty on Plant Genetic Resources for Food and Agriculture, EU Action Plan for the Conservation of Biotic Diversity and Plant Genetic Resources for Food and Agriculture, national programmes (for example: programmes for the conservation of the environment, for nature protection, for the development of the countryside and Slovenian Agri-Environment Programme (SAEP)), and the strategy for the conservation of biodiversity in Slovenia. In addition to that, the goal is to conserve as much biotic and sort diversity as possible in plant production, which is the base for the production of food, and conserve landscape diversity, which is the source of income for farms and part of the natural and cultural heritage. Since 1997, the total number of sorts in production has increased in maize, common wheat and potato, and remained unchanged or decreased in other crops, for example oil crops. Between 1990 and 1997, the production of wheat in Slovenia was based on two sorts, Marija and Ana. They occupied more than 60 % of arable land. Between 1997 and 2004, the number of sorts in the sowing structure of wheat increased significantly. The Žitarka sort has the largest share, followed by Soissons, Profit, Renan, and lately, Isengrain. In Slovenia, barley is produced mostly for fodder; as in wheat, its production between 1990 and 1997 was based on three sorts. 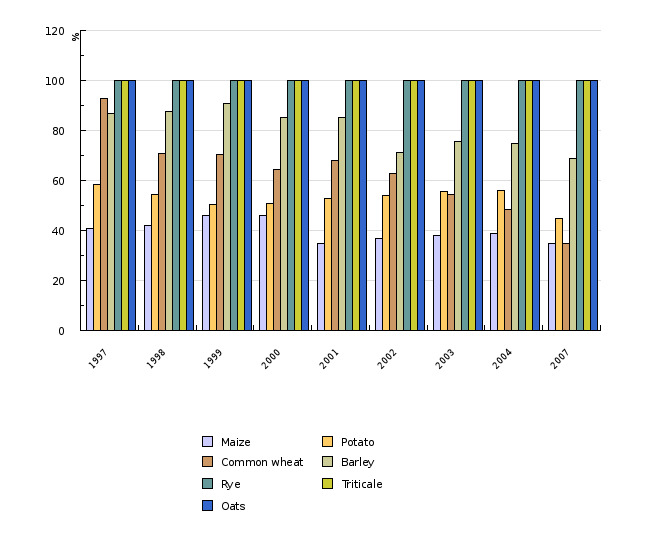 The number of sorts in the production of barley increased significantly after 2000. In potato, sort structure has changed significantly in the last twenty years. Before 1989, domestically bred sorts prevailed, but after the spread of the PVYNTN virus in 1990, the range of potato varieties changed completely and caused the domestic sorts to almost entirely disappear from production. In the last few years, the Slovenian catalogue of varieties has become longer and with it, the number of sorts on the market has increased. Simultaneously, however, shares of individual sorts in the total production have been decreasing. Between 1990 and 1997, the total number of maize hybrids decreased by more than four times, which is the consequence of interrupted trade flows with the republics of former Yugoslavia. After 1997, the number of hybrids increased to 198 by 2004. The reason for the relatively large number of maize hybrids in the catalogue of varieties and on the seed unit market is in the diverse climatic and soil conditions which facilitate the production of hybrids from all maturity classes. Until about 2000, mostly older foreign sorts and domestic, Slovenian sorts of fodder crops prevailed on the Slovenian market. After 2000, with the arrival of individual modern foreign sorts, the sowing structure started to change; a great number of Slovenian sorts were abandoned, and almost completely disappeared from the market. The supply on the grass and legume crops market, however, has become more versatile: in the past, two or three sorts at the most used to prevail in individual species, and now, the majority of species have a number of sorts in the sowing structure. Only legume crops, sown mostly in short-term blends, have only one or two sorts in its sowing structure. This applies to the period from 1990 to the present day. – List of Released New Domestic Varieties of agricultural and Forestry Plants in the Socialist Federal Republic of Yugoslavia (Official Gazette of the SFRY for 1987–1990). – National List of Varieties (Ministry of Agriculture, Forestry and Food (MAFF) for 2000–2004). – Seed catalogues (Semenarna Ljubljana, d. d. for 2000–2004). – Statistical Yearbooks of the RS (Statistical Office of the Republic of Slovenia) for the last ten years. The data are taken from annual reports and publications by the Ministry of Agriculture, Forestry and Food - Phytosanitary Administration of the Republic of Slovenia (PARS) (source: Report on Agriculture, Food and Forestry, and publications by PARS MAFF for 1997–2005) and data on the sale of seeds for individual crops (source: PARS, MAFF, Semenarna Ljubljana, d. d. – unofficial data). The main sources are data on applications for protection, entry and withdrawal from the national variety list, as well as Statistical Yearbooks of the Statistical Office of the Republic of Slovenia. For 1990, the only source is the List of certified new domestic varieties of agricultural and forestry plants in the SFRY. The sort structure in the production of potato for human consumption can only be deduced from the data on seed potato sales. These data underestimate the Y virus resistant sorts, which can be propagated by the producers and are thus not covered by statistics. – EuroSemStats database 2002, maintained and distributed by the NIAB (National Institute of Agricultural Botany, Cambridge, UK).